Lawrenceville United and Lawrenceville Corporation are pleased that 44th and Summit Development LLC has voluntarily withdrawn the demolition permit application for the Holy Family church, filed on May 29, 2018. Completed in 1940 to serve the growing Polish immigrant population in the Lawrenceville area, the church is a contributing building to Lawrenceville’s current nomination to the National Registry of Historic Places and one of the neighborhood’s most iconic buildings. 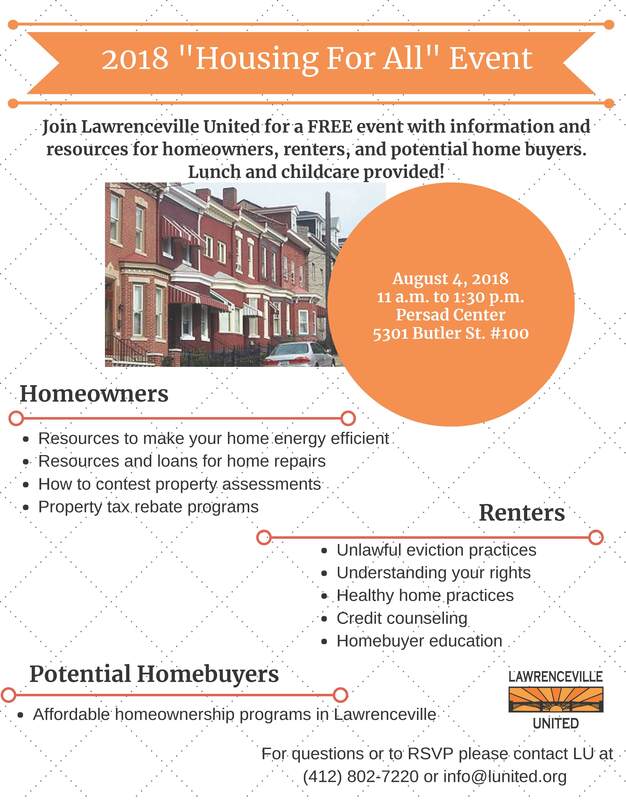 Lawrenceville United’s (LU) mission is to improve and protect the quality of life for all Lawrenceville residents. Lawrenceville Corporation (LC) serves as the catalyst and conduit for responsible growth and reinvestment in the Lawrenceville community. Together, LU and LC steward development in the neighborhood, ensuring that individual projects comport with neighborhood plans and values, and contribute to the authenticity of the neighborhood. As a part of this effort, our organizations created a community process that provides a forum where new development projects can be discussed, vetted, and measured against community plans and priorities. Several years ago, LU and LC worked with the property owners on a robust community process for their proposed redevelopment of the former Holy Family Church and School for residential housing. This community process included large community meetings as well as smaller focus-group sessions with residents from different impact areas. Hundreds of residents participated in the process. In response to articulated concerns, the owners revised their plans to reduce the overall unit count while increasing the parking. Notably, the adaptive re-use of the historic church structure was central to the plans. LU and LC publicly supported these revised plans. Documents from this community process are available on LU’s website at www.LUnited.org. Our organizations were hit unexpectedly with the recent demolition permit application without advance notice, and we viewed the proposed demolition as a serious deviation from the agreements and commitments made by the property owner. In response, the LC and LU co-submitted a nomination to the City’s Historic Review Commission for historic listing of the Holy Family Church. Prepared by Preservation Pittsburgh with support from the Lawrenceville Historic Society, the nomination ensures that—for the near term—any and all proposed exterior alterations of the church must be reviewed and approved by the Historic Review Commission before they take place. 44th and Summit Development LLC withdrew their demolition application on Friday, June 16th and released a statement indicating that they are committed to working with the community to formulate a new path forward. LU and LC appreciate this orientation and remain fully supportive of responsible redevelopment on the property that aligns with community priorities. The continued dilapidation of a vacant and blighted 1.5-acre site in the heart of Central Lawrenceville is not beneficial to neighbors or the community at-large. We look forward to working in good faith and in earnest with 44th and Summit Development and other partners on a community-supported plan for redevelopment of the site that includes the preservation of the sanctuary. We thank Mayor William Peduto, Councilwoman Deb Gross, Preservation Pittsburgh, Lawrenceville Historical Society, and Pittsburgh History and Landmarks Foundation for their support in preserving this historic church. Representatives from Michael Baker International, the City of Pittsburgh, the Pennsylvania State Historic Preservation Office attended the 10th Ward Block Watch on 2/13/2018 to provide an update on efforts to nominate Lawrenceville to the National Registry of Historic Places through the National Park Service. For more information, please see the presentation below. Presentations will also be provided at the 9th Ward Block Watch on 2/20/2018 at 6:30 p.m. at St. Mary’s Lyceum, and at the 6th Ward Block Watch on 2/26/2018 at 7 p.m. at St. Augustine’s Church, Lower Room. On behalf of Lawrenceville United and Lawrenceville Corporation, thank you for the opportunity to provide comments to the draft operating permit for McConway and Torley. Lawrenceville United’s (LU) mission is to improve and protect the quality of life for all Lawrenceville residents. Lawrenceville Corporation (LC) serves as the catalyst and conduit for responsible growth and reinvestment in the Lawrenceville community. 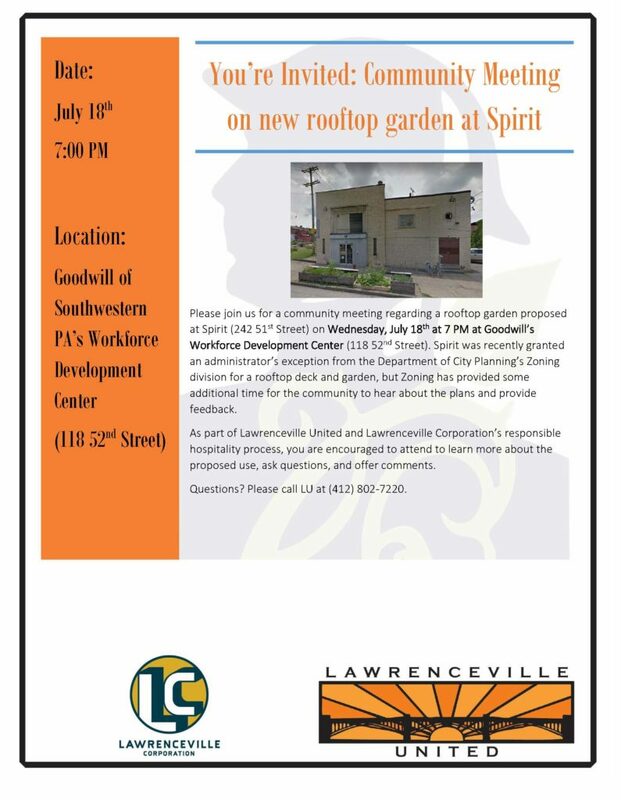 Since around the time of Allegheny County Health Department’s 2015 draft operating permit for McConway and Torley, LU and LC have organized a number of community meetings related to the steel foundry and the air quality permit process. We thank the Health Department for working with us to provide presentations to the community about the details of this draft operating permit. Special thanks is owed to David Good and JoAnn Truchan for making time to come out to multiple community meetings. Fence-line monitoring should continue and be a requirement of the final operating permit. Residents have every right to be concerned about emissions of toxic metals into a dense residential neighborhood, based on the documented health risks associated with these pollutants. Over the course of the fence-line monitoring timeline, the general trend of the monitored results has been a decrease in the average concentrations, which is reassuring. However, of stationary air pollution sources in Allegheny County, McConway and Torley was still the 5th largest source of manganese emissions in 2016, and the 8th largest source of chromium emissions, according to the DEP. Furthermore, the monitor continues to show spikes in manganese levels on certain days well above the 12-month average. The monitor also showed a significant and sustained year-long increase in chromium levels between March 2016 and April 2017, more than tripling the 12-month average. It doesn’t appear that analysis has been done by the Health Department on the potential causes of this variability, or on comparing spikes in emissions to production levels at McConway and Torley. Additionally, residents have expressed concerns about the monitor’s location with respect to prevailing winds, as well as questions about how representative the monitor’s results are, since it only runs 1/3 of the time and on a regular schedule that can be easily anticipated. In the interest of protecting the health of residents and providing transparency to the community, the Health Department should at minimum require the continuation of the fence-line monitor as part of the operating permit for McConway and Torley until these questions can be adequately answered by the Health Department. Emissions testing in the operating permit should be more frequent than every five years. Again, given the foundry’s location within a dense residential community and the known health risks of the pollutants involved, it is entirely reasonable for the Lawrenceville community to want timely and transparent access to reliable emissions testing results. Requiring emissions testing only every five years is too infrequent for the community to have confidence that the terms of the operating permit are being met. The Health Department should require emissions testing on a more frequent basis as part of the operating permit. Odor complaints need to be addressed. While the draft operating permit prohibits McConway and Torley from emitting malodors beyond its property line, we are concerned about the Health Department’s history of enforcing this. According to data from the Smell Pittsburgh app, 15201 had the 7th highest number of smell complaints out of 85 zip codes last year – 316 total complaints. 58 of those complaints specifically mention McConway and Torley, and the vast majority (86%) of those complaints were marked “definitely noticeable”, “it’s getting pretty bad”, or “about as bad as it gets.” 91 additional smell complaints noted an “industrial” smell or specifically mentioned “foundry.” LU has received reports from nearby residents noting that in addition to the smell, residents have experienced a bad taste from the air and stinging/watering of the eyes. Despite the quantity and intensity of these complaints, the Health Department reports that no notices of violation have been issued to McConway and Torley regarding odors, and it appears that no analysis has been done to compare odor complaints to the foundry’s production levels. Consequently, LU and LC implore the Health Department to mandate better odor control technology as part of this permit, or else to better investigate and enforce the complaints it receives; otherwise, the site level condition around odor emissions is meaningless. More communication and study is needed by the Health Department on the potential health effects of air pollutants to Lawrenceville residents. We know that Allegheny County is home to some of the worst air quality in the nation, that poor air quality creates significant health risks (particularly for more vulnerable populations), and that industrial sources are one of the largest contributors to local particle pollution in the County. Residents have reasonably asked the Health Department for more information and analysis on incident rates within the Lawrenceville neighborhood of health risks associated with the pollutants that McConway and Torley emits. Despite these requests, no communication from the Health Department’s epidemiology team has been received, and the Health Department declined Lawrenceville United’s request to extend the public comment period to provide time for residents to hear from a medical expert at the Health Department and have their questions answered. The Health Department should not have this disconnect between its air quality permitting and epidemiology programs. The potential health effects of air pollutant emissions should be central to the permitting process. Residents want to understand how the Health Department not only applies federal regulatory standards through its air quality permits, but is actively working to improve the air quality of the County. Lawrenceville is home to over 10,000 residents, including significant populations of older adults, children, and individuals from low socioeconomic backgrounds, who are placed at greater risk by pollutants and poor air quality. The community deserves further study by the Health Department to understand how Lawrenceville residents—particularly the most vulnerable—may be affected by air quality. Cancer rates among adults in Central Lawrenceville exceed city averages by considerable margins, and residents have asked for further inquiry. In closing, we ask that these requests be reflected in the final operating permit for McConway and Torley. We believe that these requests not only protect the health and quality of life of Lawrenceville residents, but would also serve to strengthen the ongoing relationship between McConway and Torley and the residential neighborhood. Thank you for your consideration and for the Health Department’s engagement throughout this process. We look forward to receiving correspondence on these matters.